HSM Pure 630s Strip Cut Shredder is the perfect paper shredder for high-end office applications in busy work environments. Organizations can perform all data disposal operations on it with safety guaranteed. Its shredding capacity makes it suitable for sharing between multiple users. This amazing document shredder uses German-made lifetime warranted cutting rollers to shred material into 1/4” strips. It effortlessly shreds paper clips, staples, plastic cards, and optical disks besides normal paper. HSM Pure 630s has a cutting capacity of up to an impressive 42 sheets, with their maximum allowable width being 11.8”. The powerful motor is built for continuous operation and works noise-free so the environment is not disturbed. The remarkable shredding speed of 17 feet/min is another exceptional feature as it ensures timely completion of shredding jobs. This shredder uses HSM’s infamous jam prevention technology that stops the feed from being overloaded to the point of jamming. If a jam still does occur, it can be conveniently removed via the easily accessible reverse button. HSM 630 Strip Cut Shredder has automatic start/stop feature which is powered by a light barrier. It detects when paper is inserted into the feed throat or leaves the machine, and turns the motor on/off accordingly. This saves users time and effort, improving overall productivity. 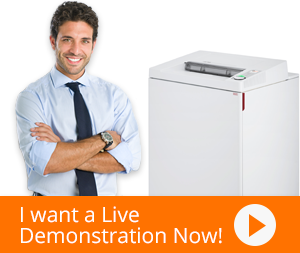 Moreover, it also has a power-saving standby mode that is activated when the shredder is not used for some time. For safety of users, it comes with a safety element that, when pressure is applied to it, instantly turns the shredder motor off. HSM 630s also has a massive 34.3 gallon waste collection compartment that is easy to empty and monitor.